Madhu is tossing and turning in the bed..! She recollects Pabhos words..! Its early morning and Madhu wakes up first ..just as the alarm rings..! She checks the time ..its 6am..and is about to get up when RK pulls her by her arm and asks where is she going? Madhu says ..its almost time.. Pabho will wake up…i need to prepare for puja! RK says but whats the rush? Madhu says.. its no rush..its routine thing.. she always gets up in time for the puja! RK says thats when Madhu sleeps at night. . but last nite it was as if she was doing breakdance in bed! RK asks why wasnt she sleeping? Madhu says..will talk to u later.. RK pulls her on top of him n says. .yunhi zindagi bhar mujh par giri padi raho..lets sleep! Madhu says.. stop being a kid.. ! RK pulls her closer.. n Madhu fumes and says.. try and understand ..! She jerks herself from RK! RK fumes and gets up and leaves the room..! Madhu says sorry.. n says try and understand..! Pabho is making roti..in the kitchen as Madhu reaches ..n asks to get flowers..! Pabho asks .. slept well? Madhu says .. should have told me to make all this! Pabho says. .making halwa puri ..for RK …! Madhu says. give me too and Pabho says.. sure. but first morsel is for RK ..! Pabho asks Madhu to prepare for the puja and asks about Radha..! Madhu says..she is not well ..so due to med effects might be asleep..! Pabho says.. its about the weather of this city… its about lifestyle..! She says.. one should be like a tree.. rise high but be rooted to ground! Right then Radha comes and Pabho taunts about being late..! Radha says.. cant get up early these days! Pabho says.. the house where the housewife doesnt wake up on time..its fortunes are bound to be covered with darkness..! The trio proceed to do puja..! RK is getting ready and Madhu comes to him..! She says looking very handsome! RK does not respond! Madhu says.. i know ur angry. .n that i shouldnt have shouted on u..! RK is looking for something n Madhu helps out! Madhu says…tried to make him understand.. n notices RK struggling n again helps out..! Madhu says.. am sorry.. should have explained nicely but dinno how! Madhu again helps RK to find his files..! Madhu says saying sorry .. please talk to me..! RK is about to take a perfume n Madhu says its mine. .girls one.. ! RK takes another perfume n is about to leave n Madhu asks.. how long will u move along like kadva karela? Said sorry already! Servant brings breakfast for RK..! Madhu says.. Pabho made breakfast for u..! RK stuffs her mouth n says. .whole day blabbering ..n now started to blabber in sleep too! RK says. not angry on u ..rather happy ..! He says..she is Kanya Kareli since last night ..so tell me what is wrong? 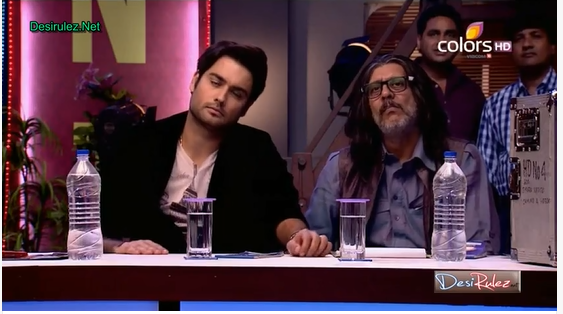 RK says.. ur hubby knows all ur expressions. .so ..tell me what is troubling u? Madhu says. .all is well ..why should i be upset or fall sick? RK says something is hurting.. tell me the matter? Pabho is waiting for RK-Madhu at the dining table..and says.. why are they not here yet.. its about breakfast not lunch.! Kuku says..nice halwa.. give some more..! Pabho says.. all are starting breakfast without RK? A family should eat together n Kuku says.. if we were considered family would have eaten together but..! Pabho serves breakfast for RK in a plate and takes to RKs room ..! Radha tries to stop her but Pabho goes..! Radha goes to get the halwa puri for others..! Sikky says.. halwa aur puri ke bagair. life hai adhuri ..! Dips says. .not interested! RK asks Madhu what is the matter? Madhu says. .had a bad dream. n RK says where she saw him as half ullu n after waking up ..she is trying to make him.. pura ullu..! RK says.. now need to use third degree..! 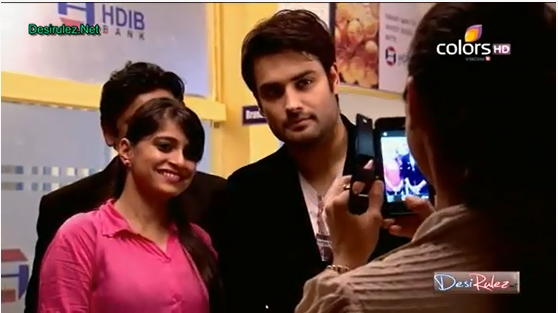 RK says 3 ..2 ..1 .. and picks up Madhu ..! Madhu stammers..and says leave me.. ! She says.. if Pabho sees..dunno what she will think! Right then Pabho comes and is shocked to see them in that position..! Pabho says.. purani adatein .. life is touf without them..! She sees other breakfast stuff for RK and asks Madhu din tell RK that i was waiting for him? 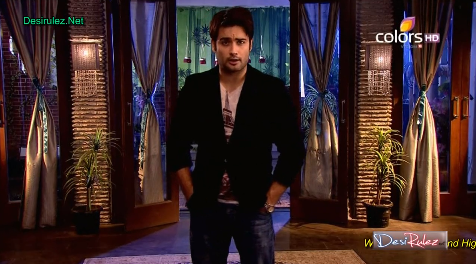 RK says..yes.. he says din come downstairs..as knew would not be able to stop eating halwa puri..! Pabho says why. .eat when u want! RK says..for his next film he has to lose weight.. so he cant eat..! RK says.. once film shoot is over.. he will wake her up from sleep.. n make her preapre halwa puri for him.! Pabho says. .pehle karam fir dharam ..! RK says. .she understands as she is his mom! RK says.. a bit of competition now.. as Pabho is against Madhu..! He says..its all her prayers.. a bit of her is in Madhu ..in love also she is like Pabho … she loves me. .takes care of me..! RK says.. thats why with one call .. Madhu came to studio..! RK says.. forgive her for missing the puja.. else she will do jagrata without bhajan.. ! RK says.. Pabhos words hurt .. Madhu so.. she was awake.. whole night and as a good hubby i had to stay awake too..! 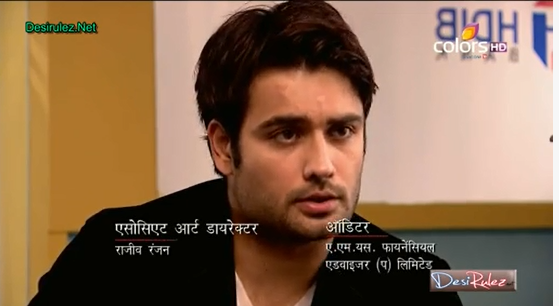 RK says.. without Madhu my work wasnt progressing..! RK says.. every time.. he fell . Madhu helped him to get up .. n walk..! RK says.. Madhu is not just my support but my strength too..! Pabho glares at Madhu n says.. after today wont say a word to Madhu.! Madhu opposes..! RK says.. my Pabho is one piece..! RK says.. gotta go.. have meeting at bank.. need supply of blessing n Pabho blesses him..! RK leaves..! Pabho looks at Madhu n she feels self conscious ..! Kuku asks Sikky will he work or only eat..! Sikky says eating is important work! Kuku says.. told u to find out who is financing RKs movie..! Sikky says.. now i remember.. that! 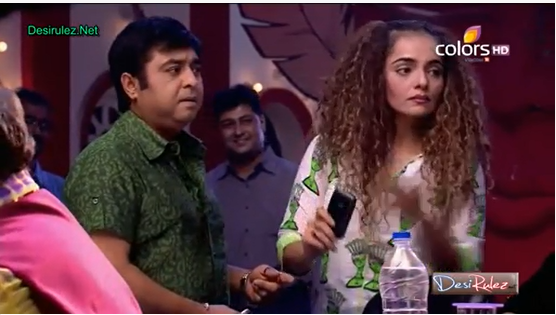 Kuku says.. am embarrassed to give birth to u… ullu ka paththa..! Sikky tries to find out all the details . .from Bittu.! He scares Bittu and Bittu drops the loan papers..! Sikky says.. wanted to say hello..n Bittu says.. no need..! Sikky asks if he can help? He ends up seeing the bank name. HDIB ..! Bittu snatches the papers from Sikky ..! RK comes and says..call forest department there are monkeys in our house..! Sikky asks where? RK says. .jo jeeta wohi sikandar.. jo hara.. n Sikky says bandar n he fumes on RK! RK-Bittu leave..! Sikky says job done. now u will know how big a sikandar is this bandar..! Kuku is sleeping with hot bag on his head..! Sikky comes n screams.n he rues..what punishment is this! Sikky says. .aaj khush to hoge tum .. n he says..how can he be..he is Kukus son! Sikky says.. know the source of RKs funding… the bank HDIB ..! Kuku calls up Amar n drops the tip ..! Pabho is praying in her room..! Madhu comes..! Pabho says.. nothing to say or hear..! Pabho says..the order Madhu wanted to give Pabho ..she got from RK! Madhu says din tell anything to RK! 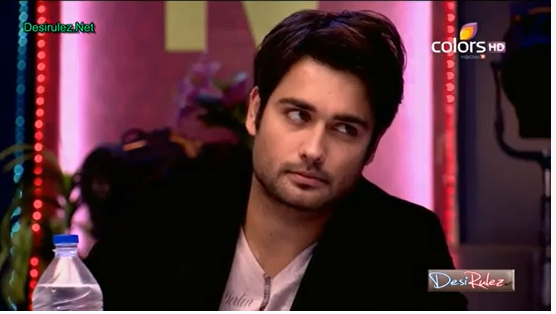 Pabho says.. RK is not someone who can know everything! Pabho tells Madhu that.. told u what i did as i thot u were my own but u complaining to RK is not appreciated..! Madhu says i din complain! Pabho says not to worry ..now will do…Tune jo chaha aur Rishu ne jo kaha… wont say a word to u..! Pabho leaves ..! RK says.. got the face that he needed for his movie… ! On 24th September will intro u all to RK productions .. first heroine..!! Precap — Bank manager says to RK.. will be happy to give up loan ..! Just as RK-Bittu leave.. Amar meets the bank manager ! The bank manager asks what can he do for Amar n Amar says.. dun sanction RKs loan! Bank manager says.. happy to give u loan RK ..wife will be more happy ..as she is his big fan..n RK teases saying am my big fan too! Bank manager talks of security … and RK says my house..! Bittu says he was against this.. that day. .n RK says Jhunjunwala was individual financer.. this is bank..all is transparent! RK says it would have been personal ..here its official! Bittu asks if he talked to RK n RK says trust me! Bank manager says.. loan will be sanctioned in a few days.. RK thanks him ..n is out of the office! Amar watches..n then meets the bank manager n tells him not to sanction RKs loan..! At home, Pabho is doing puja related stuff n Madhu comes! Madhu says.. want u to speak to me.. have made mistakes.. but not bad intent..! Pabho asks why complained to RK? Madhu says din tell .. Pabho says he forced..! Pabho says.. womans confidence is not sand..to spill …its like mountain to withstand.. all ..! Pabho says.. woman is like shade in sun ..n storm when needed. but she is like cloud..! Madhu says wont.. give in! Pabho says then prove..
She says.. dun let men know the fights between women..relay only love. to them! Madhu says we wont have any fights…! Pabho says changing words.. promise u wont tell RK .. n Madhu says.. no..coz RK n i have transparent relation..there is faith n cant break that faith! She takes Pabhos blessing..! Amar tells the bank manager about the ban …n that no one wanna work with him…n there is no heroine..! Bank manager says insuring loan against house.. n Amar says he is only wasting money! Mehul is not happy with any of the other faces for herione n RK says beautiful day.. wanna go celebrate shradh ..go n come later! He says. got finance..! Mehul says.. heroine? Roma shares..have a good news.. got heroine.. Bittu and Roma squabble n RK says. .this love tiff later. .where is heroine? Roma says ACTION n heroines mom enters first..! She says.. m DAYAN to meet RK .. Choreo says.. murgi itna bada item hai to anda kitna bada tension hoga..! The actresses mom says love ur catwalk.. n biceps n six pack abs..! She starts to think Bittu is RK and says.. u hv gained weight! Roma says forgot ur lens..! Mehul says.. chalegi . . RK says..i run the race… ye daudegi..! Mehul says.. main unme se nahi.. jo pehle seeti mare aur ant me jhanda dikhaye..! RK says..best audition ..! Radha tells Madhu …we will make Modak ..so Pabho will know what all my daughter in laws know n Dips says Madhu will do them! She says Chawl bala n Pabho chides her..n asks why so jealous? Priyanka says.. am from Jaipur.. wanted to be an actress.. since childhood..after 12th gave up studies to help in business and Madhubala is my fave show.. so when heard of contest.. participated..! Today am RKs heroine …Dreams do come true! Precap — Madhu says.. did u hear.. dun care.. not affected! RK says no..am lost in her ada.. Madhu asks whose ada? RK says .. my new heroines. .n Madhu thanks Bappa ..!